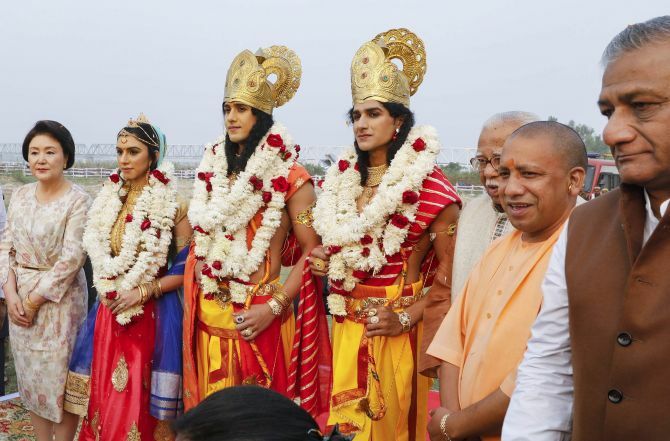 Close on the heels of renaming Allahabad as Prayagraj, Uttar Pradesh Chief Minister Yogi Adityanath on Tuesday announced that Faizabad district will henceforth be known as Ayodhya. Adityanath was speaking on the occasion of 'Deepotsav' on Diwali eve. A section of the crowd was also heard chanting 'Mandir ka nirman karao' (build a temple). Several projects, including redevelopment and beautification of 'Ram Ki Paidi' and stoppage of sewage disposal in Saryu river, were launched at the event. Opposition parties criticised the CM for this move. Aam Aadmi Party termed the decision as 'Tughlaqi' (autocratic) and said it should have taken people's opinion. Taking a dig at Aditynath, senior AAP leader Sanjay Singh said the chief minister should first change his name to Ajay Singh Bisht if he is so 'fond' of changing names. Communist Party of India general secretary S Sudhakar Reddy described it as a ploy to cover up the UP government's 'failure in governance'. "This is BJP government's ploy to cover up its failure in governance. At the same time, the name change also reflects its anti-Muslim feelings. "First it changed the name of Allahabad to Prayag Raj and now their move is to change the name of Faizabad because they think these are Muslim names", said Reddy. Meanwhile, the Gujarat government on Tuesday said it was keen on rechristening Ahmedabad as Karnavati, if there were no legal hurdles. Slamming the BJP government over the issue, state unit Congress spokesperson Manish Doshi said the promise to rename Ahmedabad was just another 'poll gimmick' by the ruling party.